Visit Santa Monica Pier and Hollywood Forever Cemetery for their historical value. Eschew the tourist crowds and head to Carpenteria Bluffs Nature Preserve and El Pescador State Beach. You'll find plenty of places to visit near Los Angeles: Temecula (Wilson Creek Winery, Temecula Olive Oil Company, & more), Oceanside (Oceanside Pier & Dolphin & Whale Watching) and San Juan Capistrano (Mission Basilica San Juan Capistrano & Mission San Juan Capistrano). Have a day of magic on the 10th (Tue) at Disneyland Park. Pack the 18th (Wed) with family-friendly diversions at Universal Studios Hollywood. Next up on the itinerary: examine the collection at The Getty Center, identify plant and animal life at Running Horse Ranch, get a new perspective on nature at La Brea Tar Pits and Museum, and immerse yourself in nature at Topanga State Park. To find traveler tips, other places to visit, ratings, and other tourist information, read our Los Angeles day trip tool . If you are flying in from Denmark, the closest major airports are Los Angeles International Airport, John Wayne Airport-Orange County Airport, Ontario International Airport and San Bernardino International Airport. In September, daily temperatures in Los Angeles can reach 34°C, while at night they dip to 22°C. Wrap up your sightseeing on the 28th (Sat) early enough to drive to Paso Robles. On the 29th (Sun), learn about winemaking at Adelaida Vineyards & Winery, then do a tasting at Halter Ranch Vineyard, then learn more about the world around you at Greenspace Creekside Reserve, and finally enjoy the sand and surf at William Randolph Hearst Memorial Beach. On the next day, do a tasting at Castoro Cellars, then do a tasting at Niner Wine Estates, then do a tasting at Moonstone Cellars, and finally look for all kinds of wild species at Elephant Seal Rookery. To find other places to visit, maps, and other tourist information, use the Paso Robles day trip planning tool . You can drive from Los Angeles to Paso Robles in 4 hours. Alternatively, you can do a combination of flight and bus; or take a bus. Traveling from Los Angeles in September, plan for a bit cooler nights in Paso Robles, with lows around 13°C. Finish your sightseeing early on the 30th (Mon) to allow enough time to drive to Monterey. Monterey is a city in the U.S. On the 1st (Tue), take a memorable tour with Tours. Get ready for a full day of sightseeing on the 2nd (Wed): appreciate the extensive heritage of Pacific Grove Oceanview Boulevard, then tee off at Pebble Beach Golf Links, and then admire the architecture and history at San Carlos Borromeo de Carmelo Mission. For more things to do, traveler tips, and other tourist information, use the Monterey day trip planning tool . You can drive from Paso Robles to Monterey in 2.5 hours. Other options are to take a train; or take a bus. Expect little chillier weather when traveling from Paso Robles in September: highs in Monterey hover around 26°C, while lows dip to 15°C. Finish up your sightseeing early on the 2nd (Wed) so you can catcht the bus to Big Sur. Kick off your visit on the 3rd (Thu): immerse yourself in nature at Limekiln State Park and then immerse yourself in nature at Julia Pfeiffer Burns State Park. Get ready for a full day of sightseeing on the 4th (Fri): trek along Partington Cove, enjoy the sand and surf at Pfeiffer State Beach, and then visit a coastal fixture at Point Sur State Historic Park. To find maps, other places to visit, where to stay, and tourist information, refer to the Big Sur trip planning tool . Take a bus from Monterey to Big Sur in an hour. Alternatively, you can drive. In October, plan for daily highs up to 24°C, and evening lows to 13°C. Finish your sightseeing early on the 4th (Fri) to allow enough time to travel to Yosemite National Park. 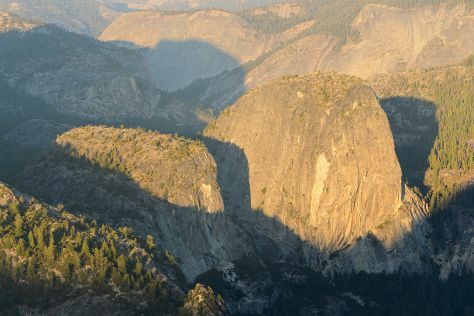 Start off your visit on the 5th (Sat): don't miss a visit to Olmsted Point, then trek along Panorama Trail, then explore the striking landscape at Sentinel Dome, and finally take in the dramatic natural features at Glacier Point. Keep things going the next day: take in the dramatic scenery at Yosemite Falls, take in the awesome beauty at Cathedral Beach Picnic Area, then make a trip to Yosemite Conservation Heritage Center, and finally trek along Four Mile Trail. To find more things to do, reviews, and tourist information, refer to the Yosemite National Park trip planner . Use the Route module to find suitable travel options from Big Sur to Yosemite National Park. Traveling from Big Sur in October, plan for colder nights in Yosemite National Park, with lows around -2°C. Wrap up your sightseeing by early afternoon on the 7th (Mon) to allow time for the car ride to San Francisco. On the next day, make a trip to Nob Hill, look for all kinds of wild species at Marin Headlands, and then do a tasting at Castello di Amorosa. For reviews and other tourist information, refer to the San Francisco holiday builder . Traveling by car from Yosemite National Park to San Francisco takes 4 hours. Alternatively, you can do a combination of car and flight; or do a combination of bus and flight. Traveling from Yosemite National Park in October, expect nights in San Francisco to be much hotter, around 15°C, while days are somewhat warmer, around 26°C. Wrap up your sightseeing by early afternoon on the 10th (Thu) to allow enough time to travel back home.